How do consumers feel about branded content? They absolutely love it, according to a recent video infographic, Consumers & Brands: A Love Story, from uberflip. The video incorporates recent research from a number of sources showing that the vast majority of consumers find branded content to be both helpful and engaging. 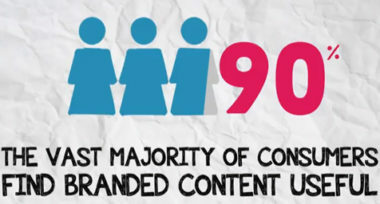 90% of consumers think branded/custom content is useful. 61% of consumers love brands that publish their own content. 75% of consumers feel brands that create custom content want to establish a good relationship with them. Content marketers have tried 12 tactics on average to attract customers, including e-books, Facebook posts, case studies, and videos. Interesting content is one of the top three reasons why people follow brands on social media. These findings reinforce the fact that custom content is often a win-win for both consumers and companies. When done well, branded offerings inform, educate, and entertain consumers while also conveying a brand message and inspiring loyalty (perhaps even love). To learn more about the power of branded content, contact MDG Advertising today at 561-338-7797 or visit mdgadvertising.com.